All visitors to China require a visa excluding citizens of Japan, Singapore and Brunei, holding ordinary passports. Visas must be obtained prior to arrival. For details of entry requirements to China and for an application form you should contact the nearest Chinese Embassy or Consulate in good time before your departure. We have been made aware that due to new regulations, some delegates may need additional documents when applying for their Chinese visa. Your passport must be valid for more than 6 months and you may need to provide an itinerary of your visit. Please inform Routes to see if we can help. In addition to the visa application form, relevant fees and photos may be required; embassies may also require a letter of invitation from the inviting company. Should you require this document from organiser, please contact us on wcise@wcise.com. Most embassies and consulates accept a scanned copy of the invitation letter and therefore Chengdu Shuangliu International Airport will issue the letters to applicants via email as an attachment. If your embassy or consulate does not accept an electronic copy, please select an alternative format in the ‘Format Options’ section of the request form. 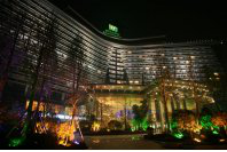 We always recommend you stay in one of our preferred hotels when you attend our Dental Show West China event. The smart Guest rooms have complimentary high-speed Internet and spacious bathtubs. The Century City International Convention Centre is only a few steps away. 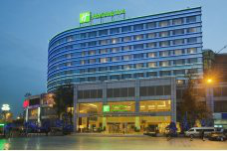 The hotel is a 20-minute drive from Chengdu Shuangliu International Airport and a 10-minute walk to Century City Metro station for the 3-stop ride to Financial City. 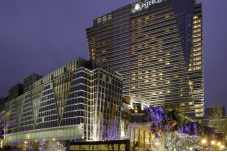 An exciting new landmark in the capital of Sichuan Province, this Chengdu hotel combines the best of all worlds. Renowned for its authentic Sichuan hospitality, the hotel features luxurious guest rooms and high-tech business facilities. Enjoy the stylish spa, where Eastern philosophies meet Western techniques. Savour international dishes or Cantonese cuisine at the five restaurants or relax over speciality teas and exotic cocktails. 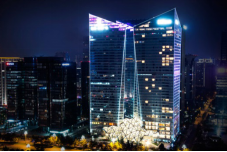 The InterContinental Chengdu Global Center is nestled within the world's largest standalone structure - the New Century Global Center. The unique structure features the concept of "Flying Sea Gulls, Floating Whales and Waves." All guests rooms epitomize the finest luxury accommodations, offering oversize bathrooms with separate shower and bath tub. 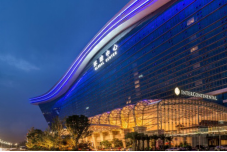 Situated opposite the rapidly expanding Tianfu Software Park, the Hilton Chengdu hotel is within 10 minutes of the New International Exhibition & Convention Centre, with Chengdu Shuangliu Airport just a 20 minute drive away. The hotel features a state-of-the-art exercise equipment in the fitness centre and a rooftop pool where you can take in wonderful views of the city. The hotel offers Mediterranean specialties in the inviting Italian Restaurant, traditional Sichuan cuisine in the sophisticated Yuxi and signature cocktails in the stylish Lobby Lounge.